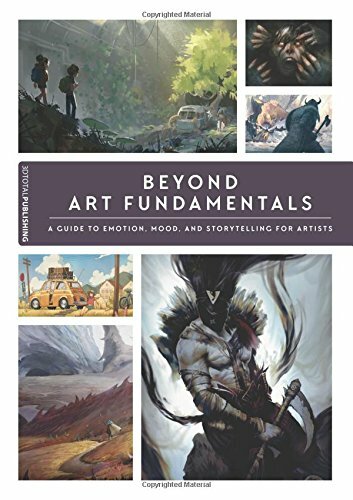 Beyond Art Fundaments is sort of the sequel to the earlier book Art Fundamentals that 3Dtotal has published in 2013. This book builds on the foundation of what's taught and shows you the application of those techniques through the interpretation of various artists. In this 224-page paperback, 18 artists are featured and each one tackles a particular emotion to bring that across in their artwork. For each emotion, we get to see a step by step walkthrough on the creative process from conceptualising to putting in the finishing touches. The tutorials are not meant to be followed along strictly, but rather to introduce you to the concepts, art fundamentals and how they are actually used. It's quite insightful going through the variety of work, learning about what the artists look out for, and their vision. There are lots of tips and techniques shared. At the end of the book is a short gallery section featuring some artworks with step by step progress pictures but without the lengthy explanation seen in earlier sections. Overall, I think it's quite worth the money for artists who want to improve themselves and learn more from others.